We do love going to Press Days. The atmosphere is always so great and it's always fun to meet other people and have one-on-ones with designers etc. 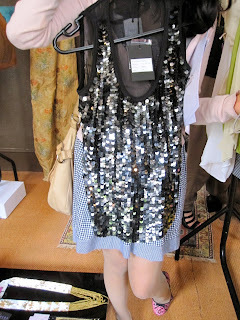 Last week, we went to the Tara Lacey Press Day, which was for SS10 and AW10. For those of you who don't know, Tara Lacey is an online boutique that specialises in luxury brands for women, from all over the world. The site focuses more on quality than household 'designer names'. The site has a lot of 'hard to find' pieces, as well as many exclusives from designers such as Olivia Rubin. These shorts are from the brand Nocturne. I really loved them a lot. They look so perfect for summer. A fringe shawl: so perfect for a night out, again from Noctune. Bllack Noir was really a label that stood out for me. This was a lovely sequin top. The whole of the Bllack Noir collection is truely fantastic. Olivia Rubin has such bright and beautiful dresses. The pinks were so bold! The bags seemed so perfect for festivals, with all the fringe. They're from the brand 'Sam Ubhi'. This was a really unique piece. They are shoulder embellishments. You're supposed to put them on plan t-shirts, or dresses and it instantly brightens up your outfit. I, personally, fell in love with the building the Press Day was held in. I am in love with old Georgian style houses, and was delighted with this one. We even got a small tour of the building as well. Everything from SS10 is online now! P.S. The winner of the Sock Theory Giveaway is Sarah from We Shop. Email us your address and I'll pass on your details to SockTheory. We had some great ideas and polyvore set as well. Don't worry, we have a giveaway going on right now, and another one due to start some time next week, so keep checking! and Sherin I love that last photo of you, you look so cute! I LOVE Gina Bacconi!!! My favourite evening dress is from their Pink Label and it has to be one of the nicest things in my wardrobe!!! i love the shorts. super cute! Love that sequin top, darling! Those shorts are gorgeous! And you look really cute in that last photo of you! All of the glitz and glamour is gorgeous and I am loving that pink dress! Love those shorts!! Can't ever have enough shorts! P.S. Love Georgian Style buildings too! looks like some great pieces!! you look so cute in that last picture. Looks like a fun day. Glad you get to go to all these events and share it with us. There are some great pieces! Looks like you are having a blast! Looks like a great day! I really like that fringe shawl! That would be a fun piece to wear! I also love that black sequin top! And I love that last photo of u! funny and cute! I love the bllack noir!!! especially the design around the neck.